The second article for National Nutrition month and our 3 part nutrition series brings us to the nutritional needs of children and senior citizens. Registered Dietician, Brandi Thomspon of ABCDEat Right, answers questions regarding these populations. Let’s begin with children. Calcium stores, the building blocks of our bones, grow from the time we are born until the age of twenty. This said, getting enough calcium is crucial. In addition to calcium, the other primary nutritional needs of kids are protein and fiber. Infants require good fats and hydration through either breast milk, formula, or water. If mom is nursing, it is important that she is eating healthfully: whole grains, fruits, and vegetables, making sure that she is consuming foods with plenty of calcium as her baby is taking an ample supply from her. Babies that are formula fed need to be observed for any intolerances from soy or whey. Intolerances can “show” themselves through incessant crying, diarrhea, blood in the stool, or vomiting. “Adolescents, or teens, are more active and need more nutrients,” says Thomspon. Just in time for the bombardment of processed food, snacks, and drinks, this age group actually requires proper nutrition: fruits and vegetables, whole grains, and water. Children should also learn to eat small but frequent meals and not to skip meals. Called “disordered eating," many kids today dismiss breakfast or go for long periods without eating before having a meal. Teaching kids how to eat properly portioned and wholesome meals is a lifelong lesson that is truly golden. “Thirty percent of children are overweight leading to chronic illnesses such as high cholesterol, high blood pressure, and Type II diabetes,” says Registered Dietician Brandi Thompson. The problem? “A basic lack of education. Parents don’t intentionally hurt their children, they do the best that they can, but there is a lack of education about how to eat healthfully." The solution? “Access to green markets and local food so people can make better choices." When asked about the chef Jamie Oliver, a crusader for healthy school lunches, Brandi thought that he was great. She started watching Oliver’s show because, “[I thought] why is this information coming from a person from another country? Why aren’t we doing this for ourselves?” She believes that Oliver’s show, which investigates typical school lunches served around the United States, “...has opened a lot of administrators’ eyes,” to the lack of whole food being prepared and ultimately consumed by the nation’s children. The new “My Plate” food serving guide put out by the USDA in June is a redesigned food pyramid. “My Plate is something people can relate to; it is easy to understand. Fifty percent of the plate should be fruits and vegetables, 25% of the plate protein and 25% of the plate carbohydrates." The only problem Thompson sees with the new food guide is that, “it is too general. It doesn’t provide people with portion sizes; it just says if this is on my plate then I’m good." 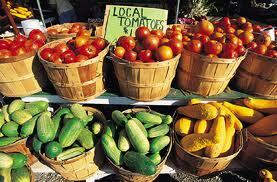 Eating plenty of fruits and vegetables is the key to health in all populations, children, adults and senior citizens. How can we eat more? “Dips, salsa, yogurt,” suggests Thompson. Also, “Being consistent with eating fruits and vegetables. Just because your child doesn’t like broccoli at that time doesn’t mean she doesn’t like it for good. It can take up to ten times before she develops a taste for it." I asked Brandi about fruits and vegetables and how there are so many types, for example: citrus, melons, nightshade vegetables, root vegetables, etc. I recalled watching a tv show about obese people in a hospital and one of the patients had an insatiable penchant for oranges. He would consume over thirty oranges a day! In response to my question, Brandi immediately advises, “Color your plate." By adding a variety of colors on your plate, you are supplying yourself with the proper nutrients and are not creating a vitamin deficiency or overload. 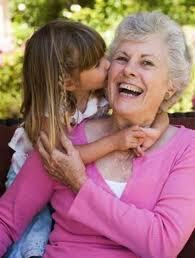 Speaking of deficiency, B12 is one of the leading nutritional needs of senior citizens. This population begins in the sixties. The body loses the ability to breakdown B12 because of a loss of stomach acidity so it must be supplemented either by taking B12 supplements or by eating foods rich in vitamin B12. A B12 deficiency can manifest in a variety of forms including depression. Osteoporosis, a medical condition in which the bones become brittle and fragile from loss of tissue, typically as a result of hormonal changes, or deficiency of calcium or vitamin D is a prominent issue in post menopausal women; therefore, consuming vitamin D and calcium rich foods is important for maintaining bone health. Eliminating trans fats, processed foods and eating plenty of fresh fruit and vegetables in addition to whole grains can help protect against chronic diseases such as high cholesterol, high blood pressure and Type II diabetes. Optimal foods for body function among the senior set include: Omega 3 Fatty Acids (chia seeds, flax seeds, fish oil), fruits and vegetables. Not skipping meals and instead eating small, frequent meals focused on nutritional quality is key recommends Thomspon. Our eating habits are formed over a lifetime and that is why it is why it is worth the investment in teaching children how to eat properly and what the benefits are of eating properly. Visit farms, pick fruits and vegetables; wash, cut and prepare foods together so children can develop a hands on relationship with whole foods. Healthy seniors can be models for children; demonstrating that vibrant living comes from, in part, from nutritional eating. 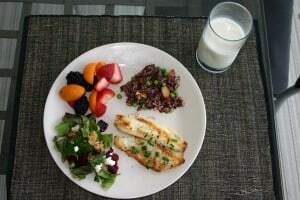 To learn more about nutrition, healthy recipes and more, visit Brand Thomspon’s website: www.abcdeatright.com. You can also follow her on Twitter @abcdeatright1. Are you a teacher in a school with a school lunch program that is being transformed? Are you growing a community garden? Have you changed your diet from a processed food one to a whole foods diet? Are you a senior that has a history of healthy eating and can offer advice about the benefits of nutrition? Send us your stories here at the blog or on the JumpSport Fitness Trampoline Facebook page or Tweet JumpSport @FitTrampoline. Until then, share this with someone you love!